Undoubtedly, Google Maps is the king of online web mapping industry by serving mind-blowing features on a silver platter. Moreover, satellite imagery, street maps, 360° panoramic views of streets and real-time traffic conditions make navigation handy. However, there are some people who’re not comfortable with it due to sluggish graphics or the lethargic loading process that delays navigation. But don’t worry as there are tons of turn-to-turn navigation websites and apps available in the market that you can rely on. In this post, we have hand-picked 10 best Google Maps alternatives that are hasty, precise and accurate as Google Maps. Bing Maps is a part of Bing suit of search engines and is owned by Microsoft. With several handy options, Bing Maps is considered as one of the best alternatives to Google Maps. It is a package of amazing features such as aerial view, road view, venue maps and 3D maps. It provides driving, cycling, and transit directions in real time. You can easily get directions from one location to another location. It shows traffic updates on your screen in four different color codes (green, yellow, black and red) from heaviest traffic to lightest traffic. Compatibility: Windows, Android, and iOS. Here WeGo is five stars rated maps and navigation software developed by HERE Global B.V. It is a reliable GPS navigation that comes with voice guidance to make your commute more fun and less distress. It supports offline maps to navigate that allows you to get directions to go from one location to another when you don’t have to access to an internet connection. In order to calculate the distance of the desired destination all you need to do is enter your landmark or address and the software will automatically do the needful. HERE WeGo is available for free and can be download from Play Store. Waze is the world’s largest community-based traffic and GPS navigation software that provides turn-by-turn navigation information about your desired location. You can know about the traffic conditions of the road you are about to hit with Waze. It also recommends alternatives route to reach your destinations without any trouble. This remarkable software also lets you know when your friends are just across the street. In fact, if you connect to Facebook, then you can also check other friends from your list, who’re driving to the same location as you. Waze is available for free and can be download from Play Store. Maps.me is a fast, free and one of the best alternative to google maps that gives you turn-by-turn navigation for cycling, walking and driving navigation across the world. If you’re visiting where the internet could be a problem for you, then don’t worry offline maps of Maps.me always there for you. You can save or bookmark your most visited locations and share them with your family in no time. You can use Maps.me to search through various categories such as tourist attractions, cafes, restaurants, hotels, nearest ATMs and public transport. The tool lets you share your location with others via social media and text message. The best part of using Maps.me app is, you can make hotel bookings directly from the app on your finger-tips. Isn’t it great? Maps.me is available for free and can be download from Play Store. It is an American free online web mapping service that provides you up-to-date satellite imagery and lives vector maps for driving and walking directions. It is a straightforward and easy way to locate your nearby points of interest. MapQuest is a lot more than voice-guided and turn-by-turn GPS navigation to offer you. You can directly access on-demand roadside assistance for help in case your car broke down. In fact, MapQuest makes sure you are always ahead than weather and tells you when to carry an umbrella. Indeed, MapQuest is one of the best google maps alternative to rely on. Don’t you think so? MapQuest is available for free and can be download from Play Store. Our list of 10 Best Google Maps Alternatives and Similar Navigation Apps for Android cannot be completed without mentioning CoPilot. CoPilot is a trusted app with a user database of almost 16 million drivers. Have a clear planning for your upcoming trip with CoPilot. It is an amazingly useful app for drivers to guide them with clear and crisp directions to their destination. It gives offline maps that can be relied upon easily for navigation. Other features include reliable offline GPS, clear voice directions, powerful route planning and driver friendly directions. CoPilot is available for free and can be download from Play Store. An ultimate navigation app nominated as the best app in 2017. A smart travel planner that finds the best and fastest route possible for commutation including bus, train taxi transit. It also checks real-time departures and provides step by step directions. Citymapper is available for free and can be download from Play Store. Stuck in the middle of nowhere. Need some help, well you can really rely on BackCountry for navigation instructions. Have BackCountry installed on your phone as it is perhaps the best GPS app that makes use of detailed topography. This is an app that is designed focusing on bikers and hikers. BackCountry uses GPS and let users manually enter longitude/latitude coordinates of their location. Makes use of reliable sources such as USTopo, OpenCycleMaps etc. BackCountry is available for free and can be download from Play Store. A high performing GPS is what Polaris GPS navigation app is. It is a free to download app that does not require any account setup and subscriptions. Rated as world’s number 1 navigation app for places with no roads. Polaris is majorly used in hiking, nautical, off-road conditions. Polaris is available for free and can be download from Play Store. 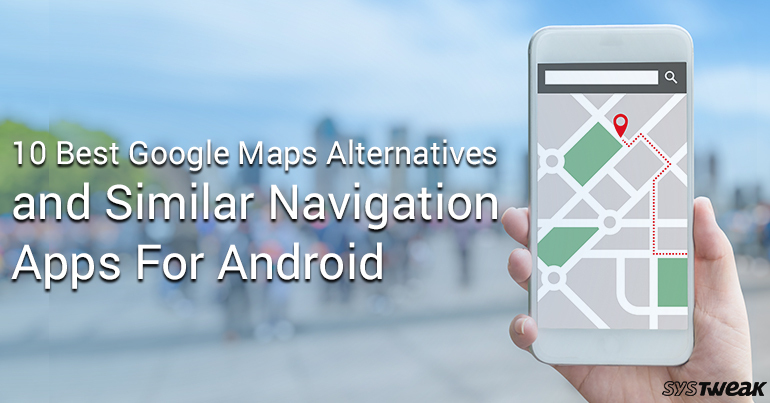 The last app in the category of 10 best Google Maps alternatives and similar navigation apps for Android is GPS Navigation. It is an award-winning application with a user database of almost 50 million users and more than 350000 5 star ratings by users. An offline navigation application that provides navigation for all the routes and places. Drive effortlessly to new places with GPS Navigation. GPS Navigation is available for free and can be download from Play Store. So, these are some of the best Google Maps alternatives that always got your back. Download and install the one that fulfills your necessities and demands.